Asda is adding around 100 new craft beers to its range in a major refresh which aims to build “the most credible beer range in the multiples”. BWS category director Drew Tiffin said there was “sea-change” in the retailer’s approach to its beer aisles, and an exciting move that would tap into the opportunity of a category that is seeing triple digit growth. He admitted that until now, Asda had not been “the most advanced” when it came to craft beer when compared to the other multiple retailers, but the move would change this. Are craft breweries selling out the indies in supermarket move? The new lines coming into store this week are being adding as a result of stripped out duplication in the beer range, which includes some more mainstream lines, although Tiffin was keen to point out that this was “not at the expense of choice”. Ale and craft beer buyer Hywel Evans said the store was making a “big commitment” to the category that would give it greater credibility. Up to 10% of the beer space will now be given to craft beer in stores that overtrade in craft beers, he said, and it will be running a promotion shortly after launch selling 4 beers for £6. New beers added to the range include Brewgooder Clean Water (RRP: £5.50 per 4-pack) which is brewed by BrewDog on behalf of a not-for-profit foundation that supplies clean water projects to disadvantaged areas across the world, a bitter from Hull-based brewery Atom Brewery called Schrodinger’s Cat, (RRP: 1.60), a dry- hopped Bad Co’s Pale Aura (RRP: £1.70), Brew York’s Little Eagle session (RRP: 1.79) and a selection of American beers, including Stone IPA from the West Coast (RRP: £2.00) and Harpoon IPA from the East Coast (RRP:2.00). It will also continue its rotation of seasonal beers, with BrewDog Hop Fiction next in store. 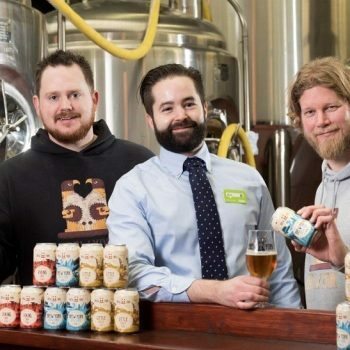 Tiffin said the retailer will concentrate on specific craft beer “hotspots” were these styles of beers have been outperforming most strongly – namely in the Scotland, Manchester, Brighton and the South Coast, Bristol and London – and making more regional beers available outside their local area. “It is all about choice – regionality doesn’t mean it has to be a local brew, we know that craft beer drinkers want to explore.” wine buying manager Ed Betts added. The retailed has also slashed around 25% of its wine range to rebalance the portfolio and add in more higher-priced and premium wines, and boosted it range of craft spirits. As part of the move it has revamped the Wine Atlas range, and adding nine new wines to its premium own-label Extra Special wine range. Asda’s move follows announcement from Waitrose, Tesco and The Coop which have also boosted their range of speciality, craft and international beer. Waitrose added around 27% to bring its total craft beer range to 95 beers, while Tesco boostings its range by a third to 70 skus across its 400 high street stores. At last! This should have been done montbs ago.Tesco are smashing tbe competition in my area.I worry that Bideford is not going ti get much change though. I wouldn’t say those listed are some of the best out there ! Can’t help but agree with Mr Muir, these aren’t anything like the best of British craft brewing, nothing against any of those supplying Asda but they are nowhere near the list that Chris mentions above, and you could probably add another dozen to that as well as the ‘Premier Division’. I’d also imagine that the Stone beer will come from their Berlin brewery rather than California. I’d love to see some New Belgium or Deschuttes appearing on the American list, especially given their parent company, rather than the same Stone that is in Tesco and everywhere else right now. I’m clear about what Asda hope to get out of these deals, the Brewers are probably reasonably happy as well (probably because they think that the it ‘won’t happen to them’ despite some notable failures when Small batch producers meet Supermarket buying requirements) but I can’t help but feel that the recent announcements from Tesco, Waitrose and now Asda aren’t great for the industry in the UK as a whole, unless of course you are Brewdog or Stone. How long can a product remain ‘craft’ when it and it’s producers have all the hallmarks of Corporate brewing? well done Asda, better choice. Have a look at Indian Runner Drinks Co. There Golden Ale and IPA are to die for.